Product does not include golf balls. Our golf ball clamshells are specifically designed for the packaging of used, second chance and other specialty golf balls. We offer a complete line of stock golf ball clamshells, manufactured out of clear plastic allowing consumers to inspect products before buying. 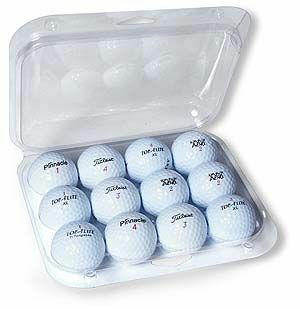 Select golf ball clamshell containers to fit as few as three golf balls to as many as 48. Three different styles include a typical flat bottom clamshell, a round clamshell container, and the popular egg carton style which minimizes movement of the balls in the clamshell. Browse our golf ball clamshell packaging sizes below and click on a product for more information and to purchase. *Note: Golf balls and tees are not included. VisiPak offers another type of packaging especially designed to fit golf balls--TUBE CONTAINERS. Follow the link to learn more about our other featured golf container.